After a ten year renovation held up by delays, the Netherlands’ Rijksmuseum (National Museum) has unveiled a site specific commission from the British Turner Prize winner, Richard Wright, comprising two painted ceilings each measuring nine metres squared in two vestibules leading to the museum’s most prized work, Rembrandt’s ‘Night Watch’. Commissioned by the curator Theo Tegelaers as part of a programme of works titled ‘A Contemporary View of the Rijksmuseum’ enlisting artists to explore the museum’s collections and role in national life during the building’s redesign, Wright’s ceilings are the only project that will survive into the foreseeable future. Having spent six years as young artist living in Amsterdam and visiting the museum, Wright was largely inspired by the architectural features of the building particularly the brickwork rather than the restored murals that line the Hall of Honour leading to the ‘Nightwatch’. ‘We worked by consulting with the architects about potential spaces in the museum for Richard to use for a permanent work. The two spaces were chosen because they were not specific exhibition galleries but took their cue from the building in that they offer an orientation for visitors as a hub between various displays. Richard works like that by reflecting and thinking about the site.’ The ceilings depart from Wright’s usual practice of installing temporal work with a limited lifespan. While Wright accepts that it is impossible to anticipate priorities for the museum in the future, the ceiling murals were commissioned as a lasting intervention in the fabric of the re-designed and restored building. 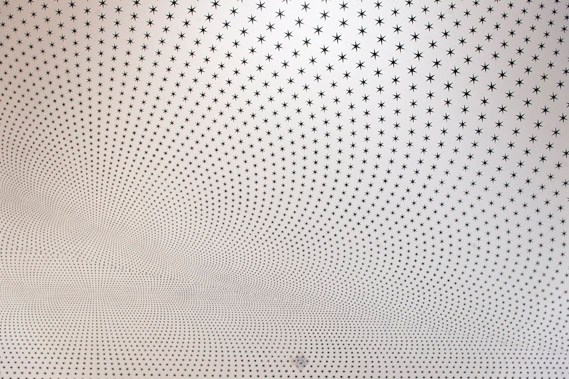 The project took seven weeks for Wright and four assistants lying on top of scaffolds to draw and paint over 47,000 individual black stars of varying sizes that spread across the entire ceilings of each space expressing the architectural dimension of each room, unusual in the building for not being vaulted. The paintings were first designed and then transferred to the plaster by hand with chalk. Despite the large number of individual stars the work is subtle and restrained so that it is easy for visitors to pass below without necessarily noticing the technical virtuosity and hours of labour involved. ‘The work has a timelessness engendered by the way it unites painting with graphic and typographical pictorial elements’ says Tegelaers explaining the nuanced quality of the commission. ‘ It has a kinship with and is reminiscent of Renaissance murals, motifs from ‘still life’ in classical painting and the organic design idiom of Jungenstil, but it also embraces elements from contemporary subcultures like Goth and Punk’. Other works made for ‘A Contemporary View’ during the museum’s closure included Simon Starling’s ‘Drop Sculpture’ 2006-2008 when he cast three copies of the 17th century original model of the figure of Atlas on Amsterdam’s Royal Palace, which he then dropped and re-assembled and exhibited in an enquiry into authenticity and restoration. Dutch artist Fiona Tan photographed friends and acquaintances in the style of ‘Golden Age’ portraits belonging to the Rijkmuseum’s collection in a work titled ‘Provenance’ 2008 linking Dutch faces from the past with the present. Germain Kruip’s ‘Rehearsal’ between 2005 and 2006 slowly illuminated the empty shell of the museum building with a breath- like pulse of light at night after the removal of all the architectural accretions added over the years. On the opening weekend, Job Koelewijn choreographed a performance, ‘Carried On Hands’ with 800 school children in the museum square producing four images of paintings returned to public view in the restored building. This group will therefore represent a new generation discovering the museum and its collections after the long closure. The Rijksmuseum has opened new galleries dedicated to Twentieth Century art and design where objects will be used to weave Dutch social and cultural history together but which also express the museum’s role as an international institution welcoming visitors from around the world. The curating mirrors the philosophy of the galleries displaying material from the Dutch ‘Golden Age’. Architectural models, airport signs, film, furniture and an aeroplane are exhibited alongside Modernist paintings from De Stijl and the CoBrA movements, sculpture and photography as part of the museum’s mission to explain Dutch historical trends and to enhance the Rijkmuseum’s role as a unique museum in the world displaying artefacts from history, design and art. The museum director Wim Pijbes claims that the renovation works had produced a complete transformation of the museum as a building and collection. The guiding philosophy of the restored museum is to instil a sense of time and beauty. The Spanish architects Cruz y Ortiz produced a winning proposal in the competition by advocating a new entrance to the museum in a newly created basement hub stretching across the entire site thereby allowing access under the public passageway running through the heart of the building that the original architect Pierre Cuypers was compelled to include to enlist the city’s consent. The old museum accommodated many such compromises and these were cited by the director for making a compelling case for stripping out numerous alterations to the original Cuyper’s design but at the same time modernising and updating the facilities for the future. One hundred new additions to the collection acquired during the renovation include the Burgomeister of Delft and his Daughter by Jan Steen, 1655 and the Bend in The Herengracht by Gerrit Berckheyde, 1672 . In bold move, the museum decided to exclude new technologies within the galleries so that videos and digital displays are absent. The only concession to cutting edge materials is the use of vitrines that reduce light reflection. The museum will also make 125000 digital images available for public use on its website in a conscious move to open up the collections and to promote greater access without copyright restrictions.